However, with this approach my table becomes a little too wide. Some rows have more content on the left side (long song names) and some rows have more content on the right side (long composer names), but none of them have both - so if I could find a way to adjust the column widths automatically based on the content, that would solve my problem. 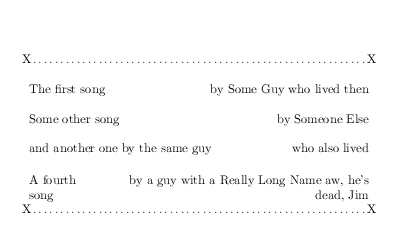 Note how the "other song by the same guy" and "fourth song" rows overlap, i.e. the right column of the latter starts before the end of the left column of the former. So instead of rigidly defining the column widths, I'd like to define the width of the entire table (between the pipes above) and have the rest done for me automagically. What's the best approach to achieve this in (Xe)LaTeX?